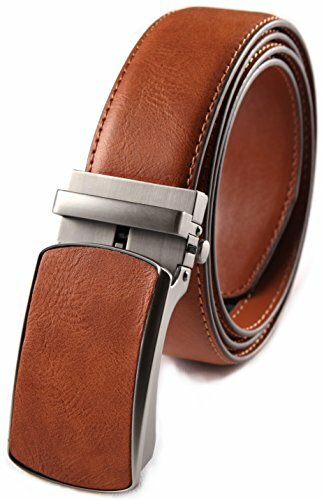 Size Mark This belt gives you an adjustable size range showing on the page, which also marked on the back of strap, the maximum size mark is at the buckle end of the strap and sometimes inside the ratchet of buckle. it is the optimize waist size this belt fitting to. you may use Leather Cleaner to clean it but never dry under sunshine or by heating. Loyal Service Customer's satisfaction is our mission- FABIO VALENTI is here to provide our esteemed customers a most pleasant experience. Our 45days free return policy, enables you a risk free purchase! For any reason you are unsatisfied with our belt, full refund or free replace is available as per your wish. ✔Size: Fits Size 30- 46 inches / Fits Waist Size 28-48"
✔ NO MORE HOLES: It is easy to use by just slide the belt into the buckle and pull the belt through, the buckle simply auto locks the belt, to release the belt, gently shove out the buckle and pull out the strap. Simple, smooth and easy! ✔ Multi Colors & styles Selection: rich and vibrant Fashion colors and styles to match with almost any outfit. If you have any questions about this product by Fabio Valenti, contact us by completing and submitting the form below. If you are looking for a specif part number, please include it with your message.